Many Catalina Channel swimmers fly into Los Angeles, swim, and fly out, and are never aware that there are seven other islands in the archipelago off the Southern California coast. They are called the Channel Islands, and the Santa Barbara Channel Swimming Association sanctions any swim to, from, around, and between the islands (all except the Catalina Channel and Catalina circumnavigation routes, sanctioned by the CCSF). Five of the islands (Anacapa, Santa Cruz, Santa Rosa, San Miguel, and Santa Barbara) make up Channel Islands National Park, which preserves and protects these beautiful wild lands and sea for posterity. Swim distances range from 3.6 miles (between San Miguel and Santa Rosa Islands) to 12.2 (the channel between Anacapa Island and the mainland) to 70 miles (San Nicolas Island to the mainland). Sanction applications received before May 7th are eligible for discounted sanction fees. Please reach out to me personally with any questions about organizing a Channel Islands swim. The application deadline for discounted sanction fees is this Sunday, May 6th, at 11:59pm Pacific time. I am on the application vetting committee for the SBCSA, and tonight I noticed something remarkable (and by remarkable, I mean a seminal moment in the history of marathon swimming). 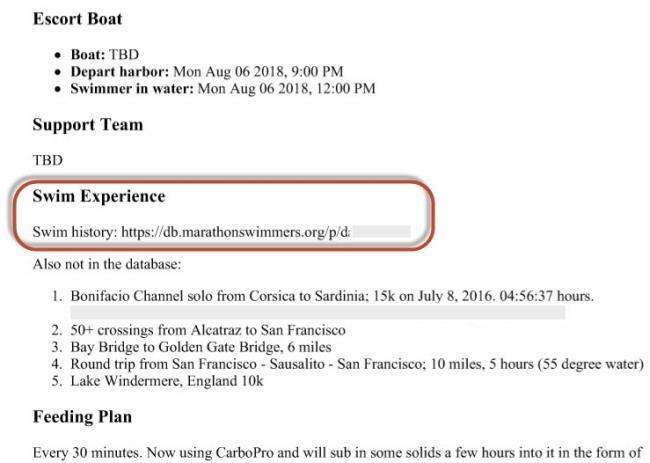 I was reviewing an application for a swimmer who intends to swim from Anacapa Island to the Mainland late this summer. The swimmer referred to his swim profile in LongSwims Database, as a partial means of documenting his swimming background for his sanction application. I imagine that as the years go by this will become very common. Swimmers will use their LongSwims Database profile as an authoritative source in their swim applications, and it will become commonplace for local swim federations to use this database as a means of understanding the swimming background of swimmers they are providing a sanction for. We will take this for granted in another few years, much like we have gotten used to track.rs as a means to make marathon swimming, somewhat, a spectator sport. Personally, I never tire of looking at those tracks of swimmers as they are in cold pursuit of one swim goal or another. I'm behind the scheduling curve (seems to be a trend in my life...), but after a small hiatus following my Catalina swim in 2015, I've decided to finish off my California Triple this year (swam Tahoe in 2014). Boat is reserved for October 1st (same date as my Catalina swim previously), and I need to finish up the Santa Barbara application... but I'm excited to be getting back into the swing of things. I needed that mental break, but it's time to get back out there! Hello experts (waving at @VanMou @evmo ) Before I start my google search, does anyone have handy links for historical Anacapa channel winds, swells, currents? I see the current info on santabarbarachannelswim.org but I'm hoping to learn about what's typical in August, September. Or if people who've been on this channel in that season can share a quick summary -- e.g., on their swim in they had 5' swell, 15kt winds... I'd appreciate it. I'm also curious about what time people started Anacapa swims, particularly if your marathon pace is ~2mph. Thanks!! Hey @cynswims, glad to hear of your interest in the Anacapa swim. does anyone have handy links for historical Anacapa channel winds, swells, currents? This buoy measures water temp and swells, but unfortunately not wind or air temp. For surface currents, see this site: http://www.sccoos.org/data/hfrnet ... if you find any historical pattern in the data, please let us know, we haven't figured it out yet. Or if people who've been on this channel in that season can share a quick summary -- e.g., on their swim in they had 5' swell, 15kt winds. For August/September we've seen a range of calm to 20 knots, flat to 5 ft swells.... a typical morning might have 3-5 knot winds building to 12-15 knots in the afternoon. I'm also curious about what time people started Anacapa swims, particularly if your marathon pace is ~2mph. The main thing is to finish before 1-2 in the afternoon (when typically the winds pick up). So for a 2mph swimmer that might suggest starting around 5-6 am if you like to swim in daylight. Thanks @evmo ! Also, thanks for your response to my teammate's queries via the website.